New tech-driven digital campaign reframes the negative message into an inclusive call to action celebrating the continent’s diversity. 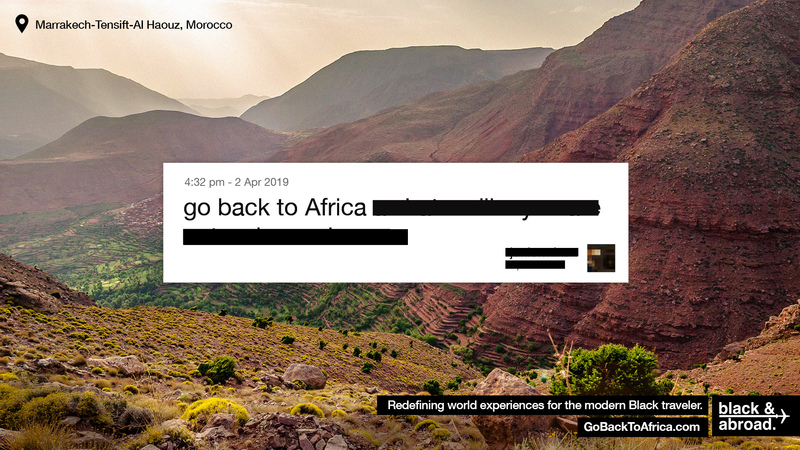 Black & Abroad, a multi-platform travel & lifestyle company dedicated to redefining world experiences for the modern Black traveler, hijacks the racialized and derogatory phrase “Go back to Africa” (#GoBackToAfrica) for a pan-African tourism campaign. 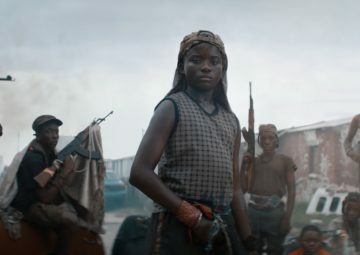 By blacking out hate-fueled Twitter posts and reframing them against words and images showing the beauty and diversity of all African countries, the brand is putting a positive and uplifting spin on a negative and disparaging narrative. One of the campaign’s goals is to effectively strip the perceived power away from those who use the phrase ‘Go back to Africa’ with derogatory intent,” says Eric Martin, co-founder of Black & Abroad. “If we can strip the expression of its impact, then we can debunk the age-old narrative that Africa is a desolate, disease-ridden wasteland undeserving of our time and travels. The phrase “Go back to Africa” has a long, complicated history, and unfortunately, today, it is still widely used in racialized contexts online and beyond. According to NetBase’s social listening platform, the phrase is used over 4500 times a month online. To create the campaign, FCB/SIX partnered with IPG’s Initiative Media to help identify and reach African Americans who are interested in travel. It highlights each one of Africa’s 54 countries then invites them to “See themselves there” by clicking through to GoBackToAfrica.com. Designed as a counterpoint to the travel industry’s bias toward Caucasian travelers, the site features all African countries, and real social photos of African Americans traveling there. At the heart of the project is an innovative digital platform designed to locate, quality control and gain permissions to use aspirational images of African Americans traveling in Africa. The platform, fueled by Google Vision and crafted by FCB/SIX, is an AI-powered content marketing engine purpose-built for the travel and tourism industry. The platform looks for images and ingests thousands of pieces of user generated visual content from Twitter, Facebook, and Instagram, then uses Google Vision’s image recognition technology to filter through content by location, subject, quality, and relevancy – all in real-time. Once curated and customized into campaign materials, the agency uses the platform to push the content out through Black & Abroad’s social channels and website. 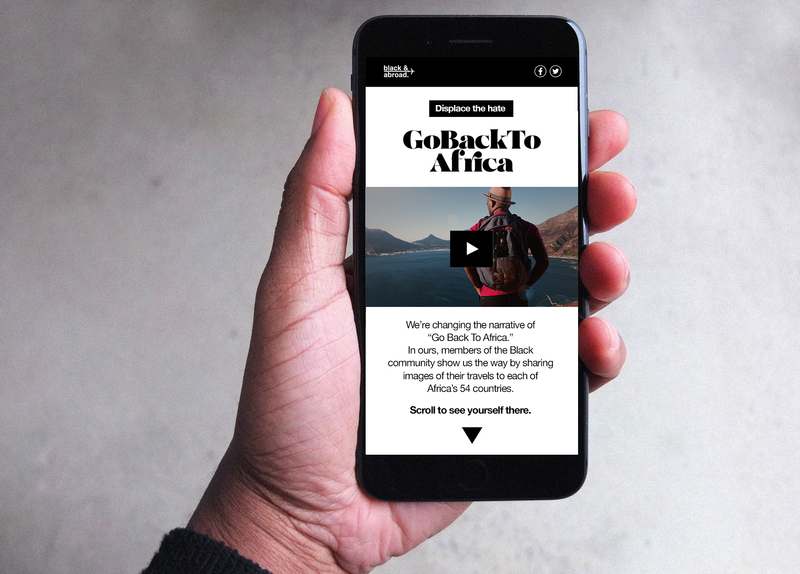 The ultimate goal is for this campaign to break down barriers and encourage conversation among Black travelers around what it means to ‘Go back to Africa.’ Through targeted efforts to effectively showcase the essence of each African country, the campaign aims to spark a movement dedicated to eroding the negative perceptions of the continent with the high volume of content it creates purposefully designed to displace and bury hateful content that exists online. Black & Abroad is a multi-platform travel and lifestyle company. Since 2015, the company’s digital outlets, international events and travel experiences have redefined world experiences for the modern Black traveler. The brand prides itself on curating international, culturally conscious luxury and adventure travel moments for Black travelers while providing a crowd-sourced information hub for urban travelers. Founders Eric Martin and Kent Johnson have been recognized by Black Enterprise, The Root, Ebony, and Huffington Post for their efforts in showing familiar faces in unfamiliar places, with its online community of travelers visiting over 100 countries and expanding awareness of the movement on all seven continents. Because of Black & Abroad’s mission to open doors within the travel industry, the founders have been invited to the United Nations to speak on diversity and inclusion, and the importance of sharing multiple perspectives within travel. FCB/SIX a full-service digital agency and a technology consultancy under one roof – FCB/SIX and FCB/SIX Consulting. The agencies bring together a unique combination of talent, including award-winning creative leaders, experts in digital media and platforms, technology solutions and development, strategy and insights, data and automation – all allowing it to design, build and implement individualized brand experiences at scale. 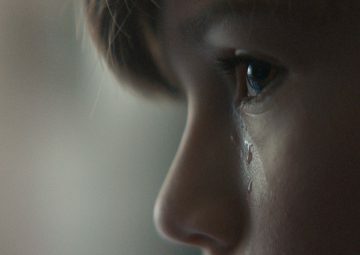 FCB/SIX is currently the #31 agency on the WARC Creative 100 and was one of the most awarded creative agencies at the 2018 Cannes Lions International Festival of Creativity. FCB/SIX is part of the FCB group of companies.